My three-year old son is a regular Michelangelo. 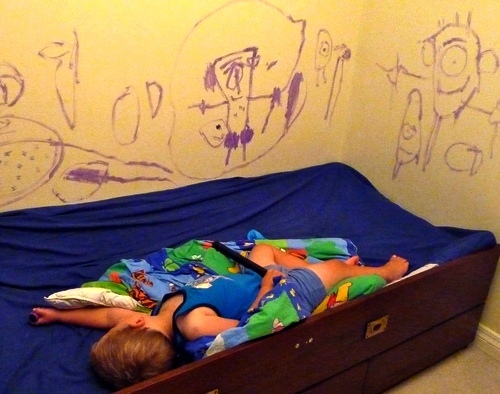 The other day he drew a purple-crayon masterpiece on the walls of his bedroom. Needless to say, I was furious. I told him he was a vandal and a crook and I belted him within an inch of his life. Then I said if he did it again I’d kick him out of the family. Of course I did no such thing! This kind of talk makes me nauseous. But I understand where it comes from. I understand that many folk imagine God to be more like Elijah than Jesus. What you look through determines what you see. Read the Bible through the fractured lens of the human wisdom and you will think the secret to life is doing right and avoiding wrong. You’ll go to God with an attitude of, “Just tell me what to do and I’ll do it.” But you are eating from the wrong tree. You are trusting in your own understanding when God would rather you trust in him. Life is not about doing right and avoiding wrong. Nor is it about sinning versus non-sinning. That’s carnal Christianity and it’s a language your Father doesn’t speak. The issue isn’t good vs evil but life vs death. And this issue is most clearly seen when we’re dealing with sin. How does God respond when you sin? In my last post I said the Holy Spirit never convicts us of our sins. Instead, the Holy Spirit brings about a life-saving correction. The difference is this. If you think the Holy Spirit convicts you because of your sin or corrects you because of your sin, you’ve missed everything. You’re looking backwards instead of forwards and down instead of up. The Holy Spirit isn’t your personal sin manager but your Helper, your Comforter, your Counselor. And in that role he will guide you (Joh 16:13), correct you (2 Tim 3:16), and, if necessary, rebuke or admonish you (Heb 12:5). He does none of this in reaction to your sin, per se. He does it because he loves you, he cares for you, and he doesn’t want you to wreck your life on some harebrained death-dealing decision. Here’s a simple test to see how well you understand this: What comes to mind when you hear the word correction? Do you think of a mistake that needs to be punished? Do you think of the “rod of correction” and naughty boys in need of a good whipping? If you do, God bless you but your thinking is influenced by the old covenant (Pro 22:15). Under the old covenant the chastisement of the Lord was sometimes fatal. If you got it wrong, you were toast. Thank God for the cross! Thank God that “the chastisement for our peace was upon him” (Is 53:5). Jesus died for our sins so that we don’t have to. This means we need a completely new definition of correction. When I hear the word correction I think of a sailboat heading in a dangerous direction. A course correction needs to be made. The sailboat isn’t necessarily sinning or wrong. In fact, it may be completely innocent but misguided. The sailboat’s sin is not the point. You can curse the map and apply the rod of correction to the sat-nav but what will that accomplish? Far better to just get back on course. In the new covenant the word for correction means “a straightening up again.” Isn’t that wonderful? It’s not “straightening up for the first time” but “straightening up again.” This implies all is not lost. You are not toast. You may be heading towards the shoals or you may have already hit the shoals and sunk your boat, but a Holy Spirit who raises the dead can still lead you back to the way of life. Your life is not over. The Galatians had started well but veered off course. They needed to be straightened up again and the Holy Spirit worked through Paul to bring about that course correction. In the Bible correction (gentle warnings) and rebuking (big warnings) often go together, as we see from 2 Timothy 3:16 above. This is how a loving Father trains his sons – not through sickness or other so-called character-building tribulations and certainly not through blows! The word “discipline” means training and God does that primarily by giving us a revelation of his righteousness through the word. Read the Bible through the lens of the cross and you will find that your loving Father is not really interested in fault-finding and sin-hunting. However, he loves you too much to stay silent as you sail towards the hidden shoals of life. If you are making poor choices, your Father will most definitely seek to bring a course correction and lead you in the life-giving way of righteousness. Instead, the Holy Spirit gently lets me know that I am sowing death into my marriage. Like a lighthouse-keeper he illuminates the dangerous shoals in front of me. When realization dawns it is natural for me to feel like a complete jerk. “I am a terrible husband and chief of sinners.” When that happens the Holy Spirit is right there to convince me that despite my poor behavior, I am still the righteousness of God in Christ Jesus (John 16:10). Look at how Jesus related to the disciples and you will find him doing all the things the Holy Spirit continues to do: guiding, correcting, and rebuking. Not once do you find Jesus saying, “Peter, you’re an idjit. Have some cancer. It’ll help you wise up.” And just look at how Jesus related to Judas. Did he call him sinner and traitor? No – he called him friend (Mt 26:50)! But hand on heart I can tell you now that without the Holy Spirit’s help, I would’ve married the wrong woman, chosen the wrong career, and I’d still be preaching the wrong message. Walking by sight I would’ve sown death left and right. By the grace of God I am who I am because my Father love me, he is good, and he cares about the details of our lives. And the good news is that if you do make a purple-crayon mess of your life, he still loves you, he still cares for you, and he will never kick you out of his family! If you enjoy Escape to Reality, sign up to our email list and we’ll notify you about new articles as soon they come out. No spam, we promise. And if you’d like to see these messages of love and hope go further, support us via our Patreon page. Love this, Paul. One of the things I always struggled with before coming to the knowledge of God’s complete grace was that i though God was the one convicting and reminding me of my sin. Boy was I wrong, and I became angry for no one ever teaching me correctly of the Holy Spirit’s role in my life. You bring out truth in the scriptures, and I tell everyone I can about your website. Some of my minister friends and I are about to start a new website for our new ministry. May we develop a ministry like yours and make impacts on our communities. Thanks for the post! Great teaching, however Hebrews 12:5 “rebuke” is the Greek word “convict.” They are the same words. Convict does not mean “be declared guilty of.” God’s loving conviction is His correction. It is His gently steering us back on course, if we have strayed. It is His reminder to us that we are dearly loved, highly valued and if we are living in sin as Christians His channel to keep us safe from walking into sin’s destructive forces. Convict is an English word and it means to “declare someone guilty of a criminal offense.” The Greek word you’re looking for is elegchō. Strongs offers several translations of this word including convict, convince, rebuke, and reprove. However, for reasons I have explained elsewhere, “convict” is a mistranslation when referring to the work of the Holy Spirit. He never assigns guilt to the guiltless. As you have illustrated, the only way to apply the word convict to the Holy Spirit is to change the meaning of the word. I suggest we just use the proper word. Thanks Paul for clarifying the word “convict” in the Bible. Unfortunately, my friends who have read JPs Destined to Reign take from the book that the Holy Spirit never reproves rebukes, or corrects us in love . While JP is correct in saying the Holy Spirit does not condemn us he is not clearly stating as you have done what the word “convict” means. JP says the Holy Spirit only convicts us of our righteouness in Christ Jesus. He has confused my friends although one would have thought from even reading Revelations they would understand about reprove rebuke etc. Before JP challenges anyone he should make it abundantly clear what he means and should have someone on his staff at least reply and clarify if he indeed has the same understanding as you. I don’t know if JP would even agree with your study of the Greek meaning. My friends from listening to JP disagree with you and me as I think they believe JP has been given a special revelation or something. In His Grip M.
Convict has acquired another meaning in church circles. The phrase ‘the holy spirit convicted me of this sin’ has come to mean the HS has revealed this to me and gave me grace to repent of it without any guilt trip. Thus there is indignation when people say that the HS does not convict of sin since many believe that this has been a positive experience for them. But others are not ‘convicted’ by the HS and have in fact been condemned by preaching. The pastor/priest is often taken to be GOD by immature Christians. Paul, I am trying to understand how 2 Timothy 3:16 relates to parts of the Old Testament such as Abraham ” being told by God ” to sacrifice his son. I’d appreciate your understanding of this. this is totally synchronous with the example that Jesus gives us about the vine and the branches: the branches that are not bearing fruit, because they have fallen into the dirt, are washed and lifted up… corrected… straightened up again! looking forward to the next post! Thanks for a well done write-up once again. I agree absolutely. He is our Abba Abba [in Hebrew there is no word for very – Abba Abba in this sense means “perfect Father”. If you want to accentuate something in Hebrew you double it , like “verily, verily” is actually “Amen, amen” … or absolute truth ( … and that’s Jesus … WoW!) the intensive form of the word. He is not just Father. He is Perfect Father!]. Rom 8:15 we are adopted children by Love! Our Perfect Father, Who knows what we need even before we ask, teaches us gently with words of encouragement and love and not by somehow destroying us first to teach us a lesson. That’s child abuse! Yes, I love the way you put it Paul – The Holy Spirit has the same perfect character attributes we see in our Lord Jesus, gently guiding, correcting, and teaching his beloved. Amen! Paul, your posts are always a blessing. Today’s is especially poignant for me because I am the prodigal who stands a sees the father far off, wondering if he will greet me with “About time you came back, you moron.” or as he was in the New Testament story. I’m stuck, trying to believe when it seems my prayers are bouncing right back to me, unheard. The last nine months have been mostly nightmare and I’m so worn out. I keep thinking it must be my sins that are keeping me from the peace others seem to find. I wanted to offer a work done by Dr. C. Baxter Kruger entitled “The Parable of the Dancing God.” It is a short booklet– free online in PDF form. It is the unpacking of the story of the Prodigal in a clear and powerful way. It has been used by YWAM in their curriculum on the Father heart of God. Colleen G, Classic Christianity by Bob George is the one that reached me. I was deep in the duties of religion and burnt out. I was a deacon in a big 3000 member baptist church and I wanted to be God’s man so I was going, going, going. As Bob points out in his book, Jesus said apart from me you can do nothing – and like Bob, I was very busy and active for the Lord, but DOING NOTHING. Anyway, our assistant pastor put that book in my hands at the right time and the lights came on – God went to work transforming my mind. I was so relieved by the freedom Grace brought in my life and so happy to be set free from the shackles of religion that I got on a plane from North Carolina to Dallas just to meet Bob and thank him for the message he proclaimed. Funny side note, I started telling folks in our church that we got 1 John 1:9 all wrong and we don’t have to keep chasing after more forgiveness and the same pastor that gave me the book came and told me how I can’t be saying stuff like that. That was back around 1999 – 2000. To take from Paul’s post, the Holy Spirit has been guiding my sailboat ever since and I’m no longer driven by guilt, shame, fear and doubt. Love is a much better teacher. 2 of my favorite examples were,[course correction].When you sail a boat,sometimes the course is zig zag,because of the wind,you sail and God corrects your course. in [AGAPE ROAD] B Mumford, sometimes we go in the ditch, we are still , within the confines of the road,but we are in the ditch.The lord pulls us out, and tells,shows etc us how not to get back in the ditch. Unfortunatly some people remain in the ditch. Thank you for such liberating teaching. My family and I love you and are lifting you and your family up in prayer. The post above has to do with correction (2 Tim 3:6), not chastisement/discipline (Heb 12:5-6). I plan to upload a post on God’s discipline in the coming weeks. I am always blessed by your posts, and often forward them to others. Thank you so much….many people are reading “The Harbinger,” and I surely would love to hear your thoughts on the book! Thank you! Is there a difference in judgment on a nation and judgment on individuals? Still learning and loving God more as I “see” His love more and more! I have not read that book. As it happens, I am today drafting some posts on judgment, so expect more on that score soon. You may also want to check out this old post on 1 Pet 4:17. Powerful! Thanks for sharing this Paul! Interestingly I was just reading John 16:10 the other day and thought the same thing! But what I really wanted to say was in reference to the ‘Fawlty applies the rod’ photo: One of the FUNNIEST shows EVER. Now I must dig out that VHS tape I made 20+ years ago when PBS ran episodes of ‘Fawlty Towers’ . . .
I’m glad someone recognized that screenshot. Yes. 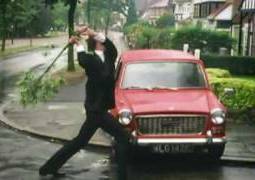 It is the single funniest scene in the funniest British comedy ever! Quite a few others videos of the series. Brilliant! I’ve seen this a hundred times and it still makes me laugh. What a perfect picture of the self life. It starts with the attitude, “I can do this. I can make it happen.” But disappointment and frustration is inevitable. When we trust in self things we inevitably end up broken down on the side of the road. And when that happens, frustration and hostility are not far behind. Sure, it may comfort the raging flesh to make threats and warnings – even hand out a “a damn good thrashing.” But Fawlty shows us the utter futility of old covenant correction. Thrash away Basil, but nothing will change. I love your blog Paul! The only good news we have is God’s grace. I’m glad you’re sharing the true gospel with people. So I’m curious. If your son’s masterpiece on the wall truly was incongruent to your desires, what sort of wage did it earn for him? How did you actually handle the situation and communicate this to your son? I ask because I desire to reflect the Heavenly Father to my children when correcting. BTW. 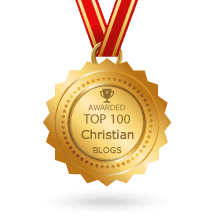 just found your blog today and am greatly encouraged! JB from Kansas USA. Good question, JB. Since he was asleep when we found him, we let him sleep and cleaned the walls around him. But not before I first took some great video footage to use at his birthday parties when he’s older. Plus, if he turns out to be a famous artist, this’ll be a particularly great memory. If he draws on the walls during the day, however, it’s a different story. We remind him of the one thing he can freely draw on – paper – and then send him to time-out to think about his drawing choices. Time-out is a quiet place at the bottom of our stairs. It’s a good place to talk to him free from distraction. We explain why scribbling on the walls isn’t smart and remind him of our love for him. Hi Paul. Loving your posts. Just stumbled accross them today as I am reasearcing the Holy Spirit for some preach prep. My church has over the past couple of years begun to embrace the true joy and freedom of the gospel and has realised the blinkers and bewitchment that religion has placed on the church. I look forward to so many more of your posts, and am currenlty enjoying much of your back catalogue. Thank you for your clear and very well researched and balanced approach to your writing. I feel like I can turn to your posts for the scriptural refrencing that I need to back up my thoughts, and I am grateful for the free and deliberate approach that you are taking to sharing the scriptural foundations for what you believe. Thank you again. This whole concept of being “corrected” rather than “convicted” is very refreshing, especially today when I am feeling pretty overwhelmed by guilt for a mistake I made. but where does “rebuking” fit in? and how do we know when we are simply being set back on the right path or rebuked for our poor choice? This is something I talk about at length in chapter 11 of my book The Gospel in Twenty Questions which (cough!) comes out next week. A rebuke is a warning. Don’t think of it as God screaming, “Look at what you did!” but “Watch where you are heading – there are dangerous rocks ahead!” God is not a faultfinder. But he will warn you when the sailboat of your life is heading towards trouble. He does this not to judge or punish you. He does it because you are the apple of his eye and he doesn’t want to see you shipwreck your life. Turning around is often a fruit of repentance but repentance itself is simply a change of mind. I was never church disciplined, but as a deacon in a large denomination; I was certainly a part of the process. None-the-less, I got to the same place you are at now. No matter how much I read, served, participated, tried; I never measured up to the expectation of the leadership (though I did to pastors who worked directly with me). The problem is that when you are in a performance/grace religion, you can, wrongly, project the views of church leadership on God. “As goes the leadership, so goes God”. In a perfirmance based religion > judgement is inherentl. How can one determine one’s performance without judging it. God is NOT the puppet of this church!! I started googling “Fed up with church”, and one of the many books I found was Andrew Farley’s “God without Religion, is it really that simple”. I found out, at least, a big part of the problem, and I was to blame. After reading that and many others (including Paul Ellis’ great books). The problem? I had allowed pastors and churches to replace the work of the Holy Spirit. Don’t get me wrong, I was saved and indwelled with the Holy Spirit. But I was “looking in all the wrong places”. Part of Andrew’s big conversion was Hebrews; where he found we no longer need a priest (or religion per say). In the Protestant religion, often, we just relabelled “priests” as “pastors” in many churches (though, of course, not all). A true pastor is a shepherd. You will know them …. They smell like sheep. So I did a total reboot. I removed any outside authority, and studied the, bible while still relying on teachings from authors and pastors. SEE this point: I did not stop listening and learning (I attend a different church). Rather I chose to let the Holy Spirit be my authority. When I got scared because it contradiated so much I had been taught. I prayed and plowed on through; wanting truth only. Jennie, that’s when I found peace, freedom, and truth and you can too!! I love my Father more than I ever did. I love to share His love more than I ever did. Don’t walk away from Christianity (you know you couldn’t if you wanted to 🙂 ). Rather walk away from flesh (performance) and focus not on how much you love God;rather on how much He loves you!!! Let the fruit of this Truth create a new fruit in you. Jennie, if you get this. Your walk the the Gospel is not ending …… It’s just beginning!!!!! Repentance by any other name.. John the Baptist would say the same, “often a fruit, but o, that it would be more”.. Luke 3. My apologies on too long a post, prior. But, it really feels like you’re just a little dishonest here.. If repentance is the same either way, you’re just spitting doctrine now… In what true changing of mind (metanoia) would there NOT be a change in behavior (turning around)? Two sides of the same.cloth? Arguing semantics doesn’t interest me.much. This is more than semantics. Telling people they must follow a prescribed set of repentance behaviors is pure law. It’s walking after the flesh (“do what man says”) rather than following the Spirit. It’s confusing the fruit with the root. This is where mixed-grace believers can get confused. “If you’re saying we should obey and do all the other stuff, what’s the difference?” The difference is WHY you’re doing all that stuff. If you’re doing it because you think you must or because you believe it earns God’s pleasure or your sanctification, you’re operating in 100% unbelief. You truly understand God’s grace! I’ve been talking about GRACE FOR CORRECTION this Month of May, and your thoughts have somewhat straightened out my idea. Thanks a whole lot! Do God’s rebukes (big warnings) make one feel bad? Let’s say you’re driving down the road chatting to your daughter. You take your eyes off the road and your daughter sees that you are about to hit a deer. She yells a big warning causing you to see the deer and take evasive action. Does your daughter’s warning make you “feel bad”? The answer to that question is the answer to your’s. Ah, ok, now I see. Thank you! Many times grace isn’t a problem but the set-up is . We think, ” Well grace keeps us from sinning so i gotta keep from sinning!” or worse, “God won’t give me grace because I already have enough to overcome this!” (when the truth is I clearly I don’t). What I’m glad about is that the Lord kept leading me here. Otherwise, no grace. It’s like missing pieces to a puzzle. Life is so hard, we need every piece we can get and you offer much of it for free here. But still it’s frustrating problem. Does God lead us around on strings? Maybe it’s ungodly confusion that does that. (I won’t name names, it’s probably bad teaching somewhere. But why doesn’t this bad teaching ever get corrected? It’s probably my own ignorance, but man I can’t carry that kind of load!) There isn’t supposed to be any sweat involved in this stuff but sometimes we want some or sometimes we can’t seem to stop sweating. I wonder where the grace of God is in times like that. After reading your Jesus is grace article, I realize much is wrong. But Jesus is grace. And that article is revelation! I understand the Holy Spirit’s work in my life. I understand that He does Not convict, condemn or accuse me when I sin. I would like to never sin again, however, I have a feeling that I will. Even Paul struggled with sin. My simple question still remains: How do I know when I have sinned? Should I just wait for the accuser to accuse and condemn me and then thank God for the Grace and forgiveness gifted to me through Jesus Christ? I don’t want to sin, but I want to know when I have sinned. The line of people who will tell you when you have sinned is long. It starts with your conscience and ends with the cops knocking on the door. Your heavenly Father is not silent when you sin. My point is that he does not convict us like a judge, but guides us as a good Father. More here. THANK YOU SOooooooooooMUCH brother. I did a lot of reading on your archive. You answered my question. Muchisimas Gracias hermano. Dios te bendiga. Hi Paul, thank you for your posts I consult them regularly for questions. About the topic of correction, I believe God corrects gently but what about those Christians who repeatedly ignore the signals such as those who are very stubborn/ignorant or blinded by self-righteousness like the Galatians? Does He let them fall in order to let them see their error in hopes that they would turn around? “Let them fall” is a strange phrase. Let’s take a simple example of a man who ignores all the signals and regularly drinks and drives. The government doesn’t want him to do it. His friends and family don’t want him to do it. The pastor preaches a message on the dangers of doing it. Yet he still does it. He is a repeat sinner who refuses to learn. Can we then say that God “let him” crash to teach him a lesson? No, the crash is entirely the man’s fault. God made us free. If you drink, drive, and crash, all ten fingers are pointing at you. Is it God’s will for you to drink, drive, and crash? Of course not. It’s all you. That’s how freedom works. The Holy Spirit wants to lead us in the path of life and daily seeks to guide us. But if we ignore him, we will find that sin is a powerful teacher as well.